WHY CHOOSE TEAM ACTUATE FOR YOUR WELLBEING SERVICE? We have been providing on site Wellbeing services to some of the UKs biggest companies since 1999. Our reputation means virtually all our business comes from personal recommendation. We have 5 star () reviews of our services at every company we work in and can provide excellent references from existing clients. I have worked with Team Actuate now for over 7 years at AOL, ASOS and Willliamson Lea. They are very professional and give wonderful massages, which are always welcome in a stressful working environment. I would certainly recommend their services to any company"
Team Actuate are personable, professional and give incredible massages. I can attest to the benefits for myself personally and for my company. They create a great feel good factor, helping reward and motivate my hard working sales force." We can offer FREE sessions for you and a selection of your staff to demonstrate some of our services. Effective for releasing tight muscles and addressing symptoms such as back pain, headaches sciatica, referred pain, trapped nerves, general stiffness and aches. Relieves musculoskeletal problems from sitting at work stations and can used to optimise sports training and prevent injury. Soothing, relaxing, a great stress buster. Acupressure treatment of the feet. Can identify problem areas, stimulate detoxification, balance the body internally. Good for treating problems such as IBS and clearing the lymphatic system of congestion. A branch of osteopathy treating many disorders through gentle decompression of the head, neck and spine. Extremely effective for headaches, migraine, eye strain, chronic pain, jaw problems, sinus problems, insomnia, anxiety and depression. Relaxing and gentle massage with essential oils. Each oil has individual properties that can for example be beneficial for skin, warming for muscular aches or treating complaints such as eczema. Given on a massage chair therefore comfortable and safe for the entire duration of a pregnancy. Relaxing treatment for the head and scalp to improve circulation and release tension. We can organise a range of classes to get your staff moving!. The main cause of musculoskeletal disorders is immobility. A key part of our advice is encouraging our clients to get moving and not to spend all day at their desks. Costs are scaled, the more work we get, the more we can reduce costs. We can cater for any number of people from a couple of hours work to hundreds of people on a regular basis tailored to your budget requirements. We only use therapists with recognised qualifications from the best training courses. All our therapists have professional and public indemnity insurance. We have a comprehensive health and safety policy, with full risk assessment and method statements and have passed numerous health and safety inspections. In addition we have strict standards of professional conduct. Full consultations are carried out prior to any clients’ treatment. All medical information is treated in the strictest confidence and data protection laws are complied with. Health and safety requirements for both for local authority bylaws regarding massaging at work and professional standards are strictly adhered to. We work with our clients to identify their companys specific needs and have frequent reviews of our services, which are consistently rated as one of the most appreciated benefits by all the businesses we work in. We manage your well being service from inception to day to day running so your company can get on with their business and reap the benefits from a happier, healthier work force and reducing the risk of liability on the part of the employer. We have never lost a contract in the 16 years we have been operating. This demonstrates that our commitment to the individuals we treat and the companies they work for has clear benefits for both staff and their employers. Team Actuates’ longest running contract is with AOL UK where we have worked for 16 years. Unlike many other companies providing these services, we do not offer a "one size fits all" routine. Each treatment addresses that individuals needs, we can make your time with us relaxing, invigorating or help with sports training for example. Our backgrounds include rehabilitation and physiotherapy clinics and each therapist is multi-disciplined. The more experience we have, the more effective your treatment will be. By using Team Actuate, companies give a clear message to their employees that they matter and they are willing to invest in their long term health. This increases retention and motivation. Feedback from staff always shows staff appreciate these services and we are consistently fully booked. The case for addressing musculoskeletal disorders by employers is well established. There are numerous studies by government bodies as to the cost both in monetary terms and in the mental and physical health of staff. As our lives become more screen based the impact becomes ever higher. "Karen is a miracle worker! I've started to suffer with a stiff shoulder over the last few months, which at the time of my visit was worsening day by day. The day after i visited Karen, my shoulder had gained much more movement, the pain had eased significantly and overall the stiffness had greatly reduced. I didn't expect to feel such a difference so quickly. Karen has made such a difference." "Team Actuate are phenomenal and I will definitely schedule again." 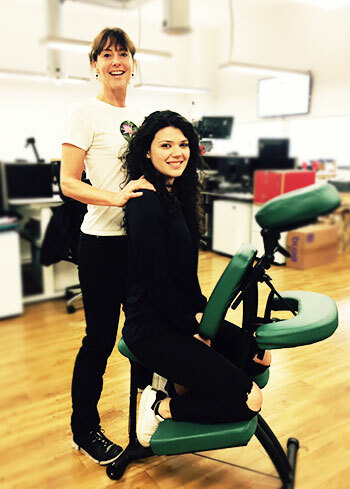 "I am a frequent user of the Team Actuate service and would recommend, they are very good at undoing all the muscle tension in my back caused by my bad posture with her deep tissue massage." "Very knowledgeable. Good advise on stretching, sitting posture and exercise. Focussed massage on shoulder, neck and backbone, reduced my shoulder pain tremendously. I would recommend people to seek her consultation and expertise. "I thoroughly enjoyed this massage. Karen got rid of any knots in my shoulders and I awoke the next morning with no aches or pains. Need to book another treatment soon. Would recommend"
"Karen has been helping me over the last few months with an ongoing back problem but more recently I have developed a niggling hamstring and Karen has been a godsend in helping me both with some sports massage and some advice on stretching. She is making a real difference to my well-being.Team Actuate are miracle workers! I've started to suffer with a stiff shoulder over the last few months, which at the time of my visit was worsening day by day. The day after i visited my shoulder had gained much more movement, the pain had eased significantly and overall the stiffness had greatly reduced. I didn't expect to feel such a difference so quickly. they have made such a difference." "The Team Actuate masseuses know their stuff and provide a great tailored service. I always leave feeling more flexible and that my body is in better condition than when I arrived!" "Team Actuate therapists are expert in their field and really know their stuff. They have made a real difference to my well being. Highly recommended, personal and friendly service." "I would thoroughly receommend Team Actuate, they provide a first-class service at very reasonable rates, and is professional and personable at all times. I really only have good things to say about them!" I have had treatments from Team Actuate for several years. They were highly recommended to me. The Team Actuate therapists are very knowledgeable in their area, and do excellent massage and cranio sacral treatments. Team Actuate therapists are clearly expert in their field, they are exceedingly knowlegeable, produce excellent results and have a friendly, professional and efficient manner. We offer FREE trial sessions for you to try our services for your company. Team Actuate is owned and managed by Karen Howell. 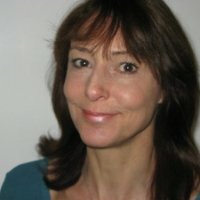 Her background as a remedial massage therapist of over 22 years experience means that only the most skilled and experienced masseuses meet her exacting standards. Having an experienced therapist as the Managing Director differentiates us from other Wellbeing providers and has ensured we have never lost a contract in over 18 years . Any Wellbeing service is only as good as the therapists giving the treatments. Average is not good enough for Team Actuate. SIT BETTER – FEEL BETER!! We all know that the most common muscular problems we see in the workplace over and over again are of the upper back, neck and shoulders. The effect of this should not be under estimated- muscular problems can lead to chronic pain and make life miserable. The Team Actuate philosophy is not just to treat but help prevent these problems for our clients. Over the years our experience is that with some sound advice we can really raise awareness to help our clients help themselves. Endless treatments without addressing the causes is only doing half a job!. Although every person is different and you may have pre-existing conditions that mean the following does not apply, here are some general tips…. Upper body muscular problems are greatly increased by 2 factors- poor posture and lack of movement. Both can be minimised if the person is made aware of these. People who sit all day, don’t take lunch breaks and are stuck in front of low screens such as laptops and tablets are most likely to suffer. Basically the human body is well designed, its user error that creates many problems! We have not evolved to be spending all day not moving staring at screens. Our heads sit on a fulcrum attaching to the spine where if we sit properly, the weight of our heads is transferred down the spine. The head only needs to stretch forward a fraction for this balance to be lost. The result is that the weight of the head is borne by the muscles in the neck and shoulders. Multiply this by the number of hours spent in front of screens and its easy to see why the more years people spend doing computer based work the more likely they are to suffer a whole range of muscular problems that can really make life difficult. Also sitting means we are sedentary which increase toxins as a result of the lymphatic system not being stimulated by movement. WHAT IS POOR POSTURE ? Most people lean on their desks with their arms. This automatically pulls the head and shoulders forwards leading to Forward Head Syndrome the posture that leads to many of the problems we treat. Over time the end result can be similar to lifting weights - bulky shortened muscle fibres that entrench the hunched posture . In essence sit up, sit back and don't sit for too long!!. Try to put your whole back into the back of the chair so the body weight is back not forward. This pulls the shoulders back, making it much harder for the neck to stretch forward.. Advising people not to stretch their necks forward when their arms are leaning on their desks just doesn’t work - which is why we need to realign the whole spine to help the neck. If you are not comfortable sitting back it could be the chair is not set up properly, you may need a lumber support or the arms of the chair dropping etc. Once you are sitting comfortably into the back of the chair, check the desk is set up correctly. You should be able to use the keyboard and mouse without stretching head or arms forward or leaning on the desk. The equipment should work around your correct posture rather than posture be dictated by the position of their screen keyboard and mouse. Sometimes a larger font can help. Men who lift weights often use all the wrong exercises if they have these problems. Any weight lifting above shoulder height and bulking pectorals will further shorten and tighten all the muscles in the neck and shoulders. These people need to minimise this type of exercise and instead do more stretching and working their lats to pull the shoulders down. Sitting all day makes the muscle fibres contract throughout the whole body. Pilates is my number 1 recommendation for anyone who sits all day, yoga can be helpful but includes a lot of twisting which can aggravate lower back problems.